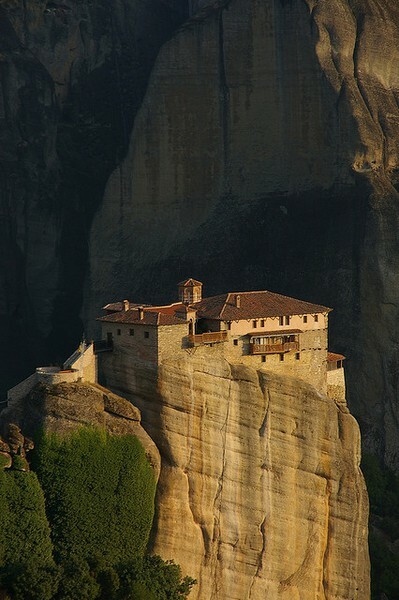 No1 Amazing Things: Roussanou Monastery, Meteora, Greece. Founded in the 16th century, the easily-accessible Rousannou Monastery occupies a lower rock than the others of the Meteora. Rousannou (Ρουσανου) Monastery was founded around 1545 by Maximos and Ioasaph of Ioannina. The reason for the monastery's name is not known - it is actually dedicated to St. Barbara - but may reflect the name of a hermit who occupied the rock. It soon declined and became subject to Varlaam Monastery by 1614. The monastery once again fell into disrepair for the two centuries prior to the 1940s, when it was damaged in World War II then plundered by the Germans. It was later repaired by the regional archaeological service and since 1988 it has been occupied by a small community of 13 nuns. Rousannou Monastery stands on a low rock and is easily accessible by a bridgebuilt of wood in 1868 and replaced by more solid material in 1930. Despite this, its situation is still quite dramatic, with the rock dropping off sharply on all sides. The monastery covers the entire surface of the rock and consists of three levels: the church and cells occupy the ground floor, while the two upper floors house the guest quarters, reception halls, an exhibition room, and more cells. The frescoes in Rousannou's Church of the Transfiguration of Christ, which is essentially a smaller version of Varlaam's church, date from 1560. The narthex is decorated primarily with gruesome scenes of martyrdom, as at other Meteora monasteries. The resident nuns tend to be friendlier to visitors than their male counterparts in Meteora and often provide sweets to guests as they relax in the courtyard (if so, it is nice to put a small donation in the box).